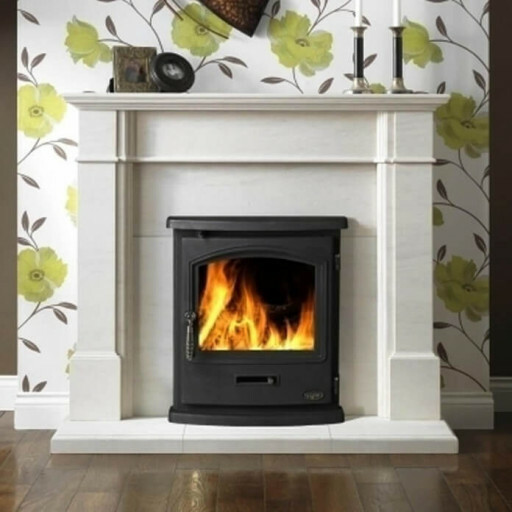 If you can't quite decide between a stove and a traditional fireplace, the Tiger Inset Clean Burn Stove is the perfect choice. Teaming perfectly with our range of limestone fireplaces, the Tiger stove features a large curved window – the perfect way to view the flames. With a heat output of 4.9KW, it’ll provide a warm, cosy feel, too.The Tiger Inset Cleanburn Stove shown in the Cartmel Portuguese Limestone Suite. The first inset stove from the gallery range is the popular Tiger a great view of the flames with its large glass door.Stove FeaturesDefra Approved for use in smoke exempt zones when burning wood and smokeless coal 4.9KW Output 82% Efficiency Airwash Technology for cleaner glass and improved combustiuon External riddling grate Clay brick lined Suitable for use with wood and smokeless fuel Good size viewing windowDimensionsWidth 520mm Height 600mm Depth 342mmFits standard fireplace panel opening 16" x 22"